In recent months, our family has been trying to move to more natural and less chemical-laden products. We had gone through so many years turning a blind eye to the huge number of harmful chemicals we were introducing into our home. However, articles that we read started opening our eyes to the dangers of using so many chemicals. That’s when we started making a lot of homemade items for everyday use. We found plenty of recipes for things like laundry detergent, window cleaner, carpet deodorizer, and much more. We also started making natural chemical-free personal care products too, like shaving cream, shampoo, lotions, body wash, and face cream. Slowly but surely, we were switching from chemical-laden products that we used to buy at the grocery store to homemade natural products. We felt healthier already and were saving money, too! 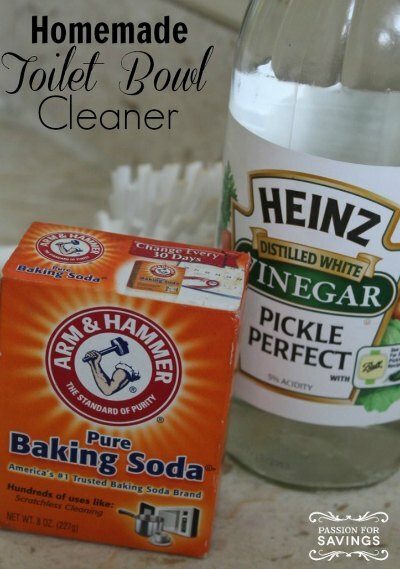 The one cleaning supply that we hadn’t found an all-natural homemade replacement for yet was toilet bowl cleaner. We kind of figured that it wasn’t such a big deal since we flushed it down the toilet and it needed to be effective, so that’s must be why toilet bowl cleaner was so strong and chemical smelling. Then, we read some information about how harmful the chemicals in toilet bowl cleaner actually are and decided that it was time to try an all-natural homemade toilet bowl cleaner in our home. With four bathrooms in the house, we realized just how much of those chemicals were being used there and how much money we were flushing down the drain. To aid in our switch to an all-natural toilet bowl cleaner, we found a website that has a recipe and instructions that were easy to follow and very effective. The toilet bowl cleaner recipe only requires two ingredients and the site has step-by-step directions for implementing the procedure.